A protester is preparing to use his slingshot to throw stones at the positions of the Israeli army snipers who are firing at real bullets. 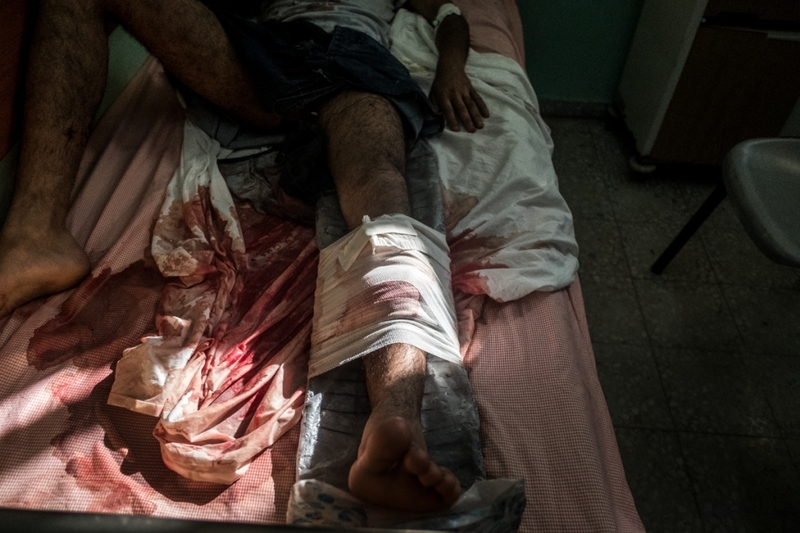 Since the beginning of the march thousands of people have been wounded and have counted more than a hundred dead. May 14, 2018. Malaka. Gaza strip. Palestine. 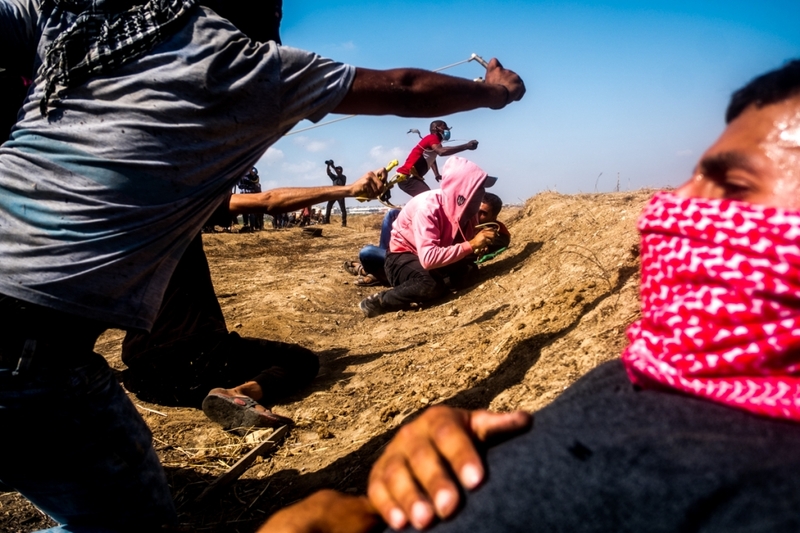 Demonstrators use stone and sling spears to reach the positions of the snipers of the Israeli army who replica real bullet. 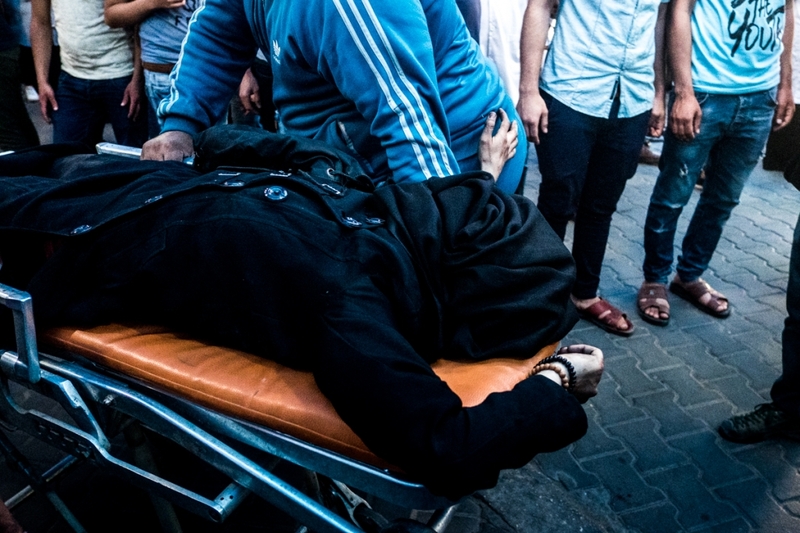 Since the beginning of the march thousands of people have been wounded and have counted more than a hundred dead. May 11, 2018. Malaka. Gaza strip. Palestine. 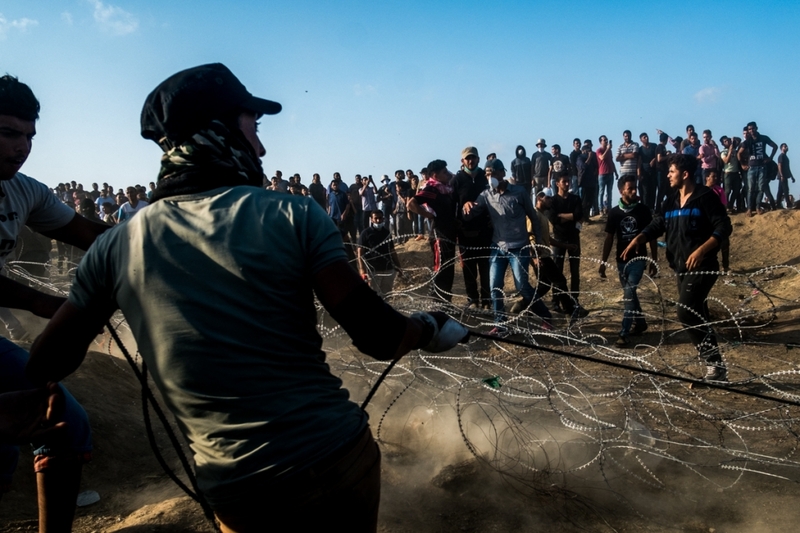 Protesters run with barbed they steal with Israeli border. 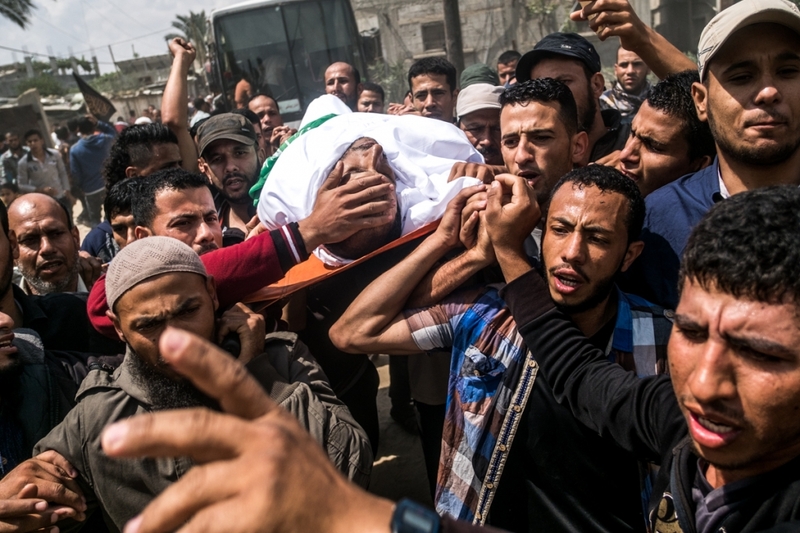 Tensions are high along the Gaza-Israel border following more than a month of weekly mass protests near the fence that has left 50 Palestinian protesters killed and over 1,700 wounded by Israeli army fire. 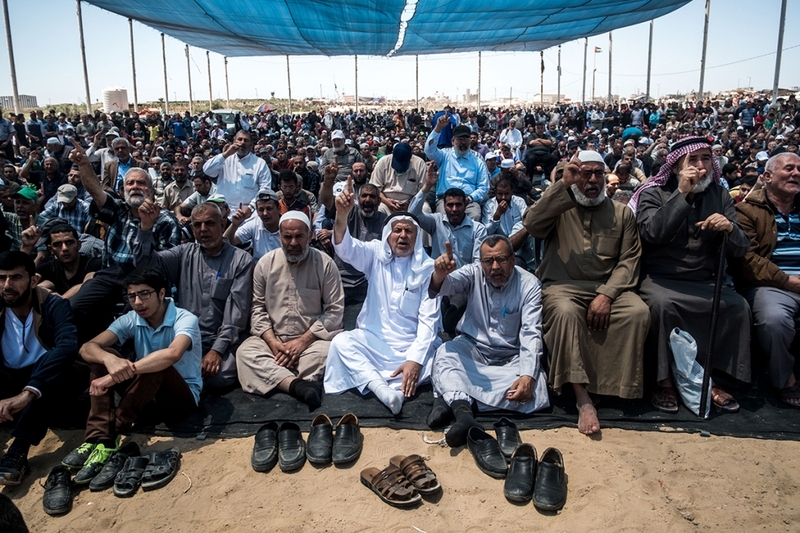 Gaza's Hamas rulers have vowed that the marches will continue until the decade-old Israeli blockade of the territory is lifted. 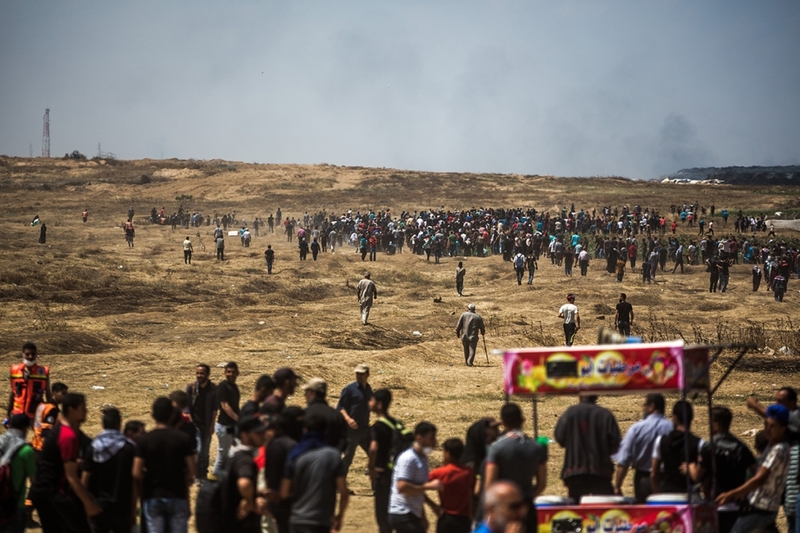 Protests are expected on May 14 and 15 also, the day Palestinians mark the Yawm an-Nakba or "Day of Catastrophe", to commemorate the anniversary of their mass uprooting during the 1948 war over Israel's creation. May,11th 2018. Malaka. Gaza. Palestine. Des manifestants utilisent des cerf-volant pour essayer de mettre le feu sur les lignes tenues par l'armée israelienne. Les tensions sont elevees le long de la frontiere entre Gaza et Israel apres plus d'un mois de manifestations de masse hebdomadaires pres de la barriere qui a fait 50 morts parmi les manifestants palestiniens et plus de 1 700 blesses par les tirs de l'armee israelienne. 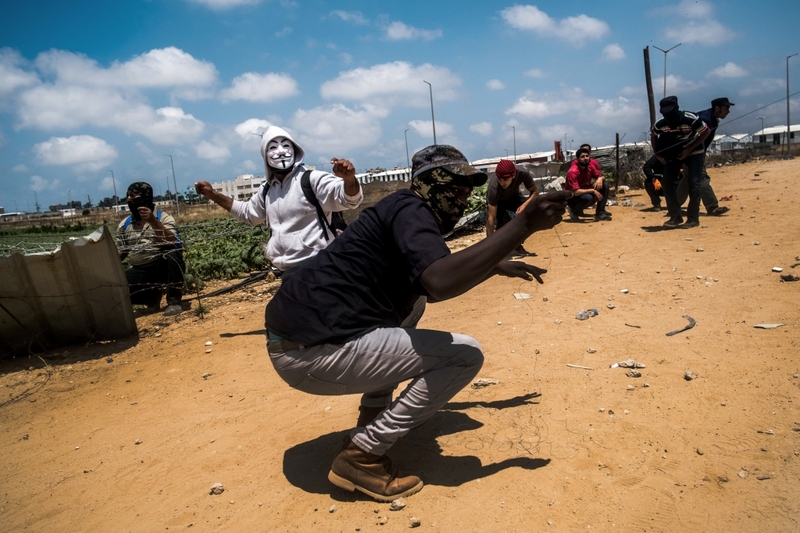 Les dirigeants du Hamas à Gaza ont jure que les marches continueront jusqu’a ce que le blocus israelien du territoire, qui dure depuis dix ans, soit leve. Des protestations sont egalement attendues les 14 et 15 mai, le jour où les Palestiniens marqueront le Yawm an-Nakba ou «Jour des Catastrophes», pour commemorer l'anniversaire de leur deracinement de masse pendant la guerre de 1948 contre la creation d'Israel. 11 mai 2018. Malaka. Gaza. Palestine. 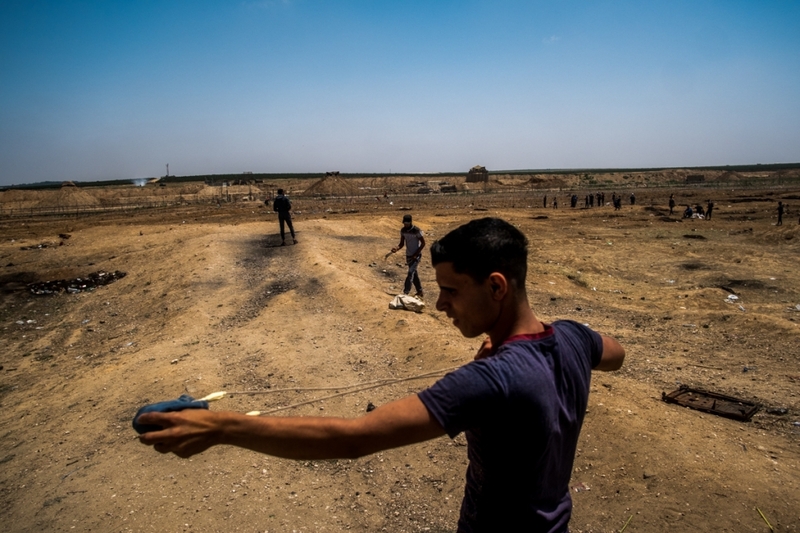 Palestinians use slingshots to throw rocks in response to Israeli forces' intervention during a protest, organized to mark 70th anniversary of Nakba, also known as Day of the Catastrophe in 1948, and against United States' plans to relocate the U.S. Embassy from Tel Aviv to Jerusalem. May 14, 2018. Gaza city. Palestine. A man wounded by bullets is transported to the ambulance where he will be evacuated from the area for treatment. 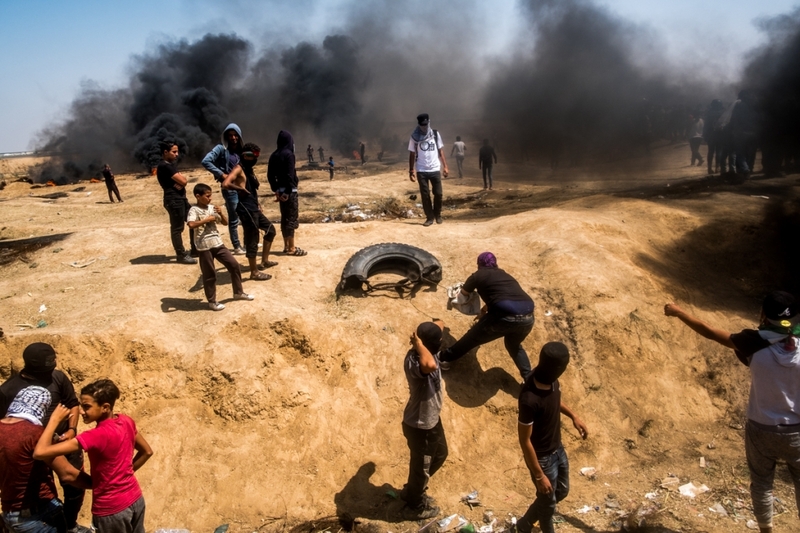 Tensions are high along the Gaza-Israel border following more than a month of weekly mass protests near the fence that has left 50 Palestinian protesters killed and over 1,700 wounded by Israeli army fire. Gaza's Hamas rulers have vowed that the marches will continue until the decade-old Israeli blockade of the territory is lifted. Protests are expected on May 15 also, the day Palestinians mark the Yawm an-Nakba or "Day of Catastrophe", to commemorate the anniversary of their mass uprooting during the 1948 war over Israel's creation. May,14th 2018. Malaka. Gaza. Palestine. 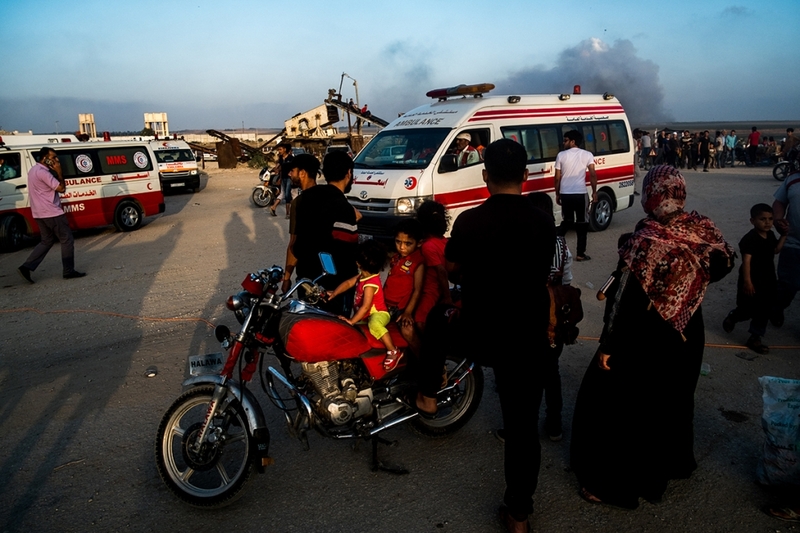 Un homme blesse par balles, est transporte jusqu'au ambulance d'ou il sera evacue de la zone afin d'etre soigné. . Les tensions sont elevees le long de la frontiere entre Gaza et Israel apres plus d'un mois de manifestations de masse hebdomadaires pres de la barriere qui a fait 50 morts parmi les manifestants palestiniens et plus de 1 700 blesses par les tirs de l'armee israelienne. 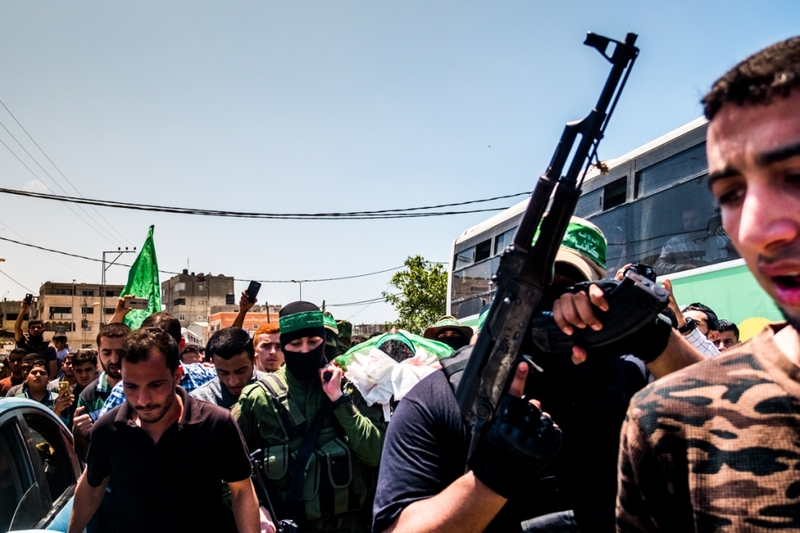 Les dirigeants du Hamas à Gaza ont jure que les marches continueront jusqu’a ce que le blocus israelien du territoire, qui dure depuis dix ans, soit leve. Des protestations sont egalement attendues les 14 et 15 mai, le jour où les Palestiniens marqueront le Yawm an-Nakba ou «Jour des Catastrophes», pour commemorer l'anniversaire de leur deracinement de masse pendant la guerre de 1948 contre la creation d'Israel. 11 mai 2018. Malaka. Gaza. Palestine. 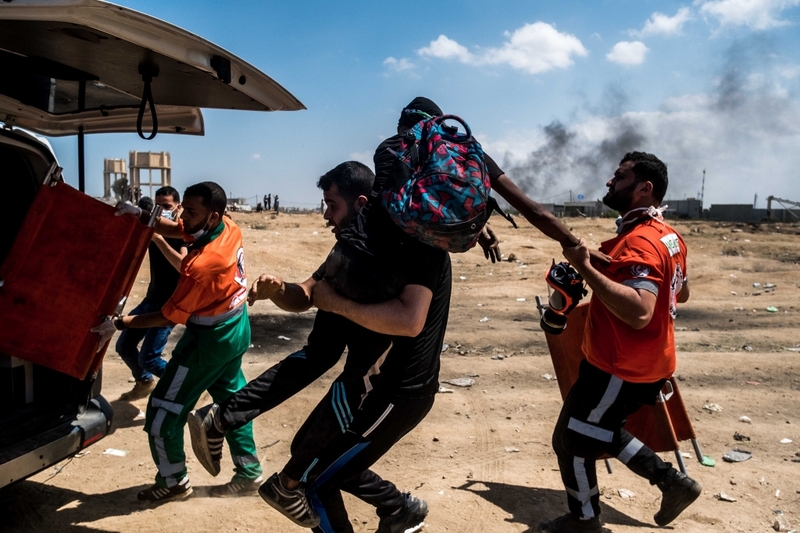 Palestinians evacuate an injured man during clashes with Israeli Security Forces along the Israel-Gaza border, on the 70th anniversary of Nakba Day (Day of the Catastrophe), which marks the displacement that preceded and followed the Israeli Declaration of Independence in 1948. 14 May 2018. Malaka. Gaza strip. Palestine. Men pray under an immense tarpaulin stretched for the occasion in the camp of Malaka near the border with israel. 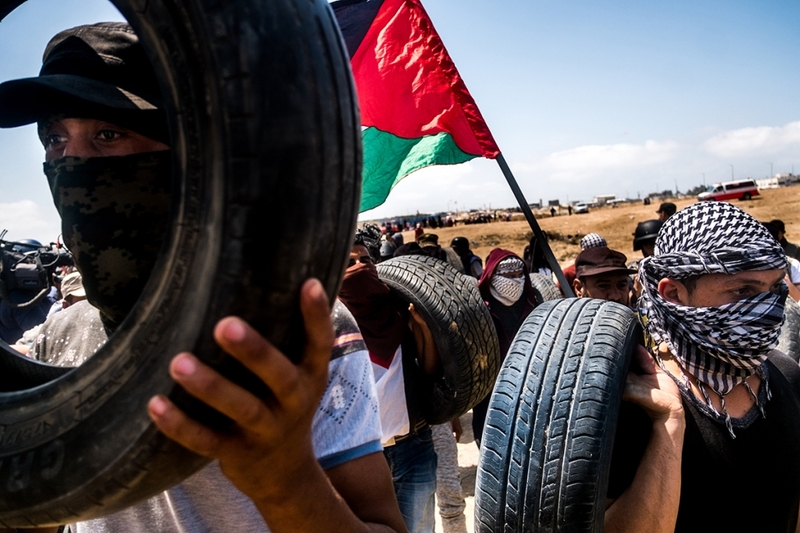 Since the beginning of the march, confrontations have begun after the Friday morning prayer, but on this day the clashes between Palestinian demonstrators armed with sling shots and snipers of the Israeli army began at 10am. May 14, 2018. Malaka. Gaza strip. Palestine. 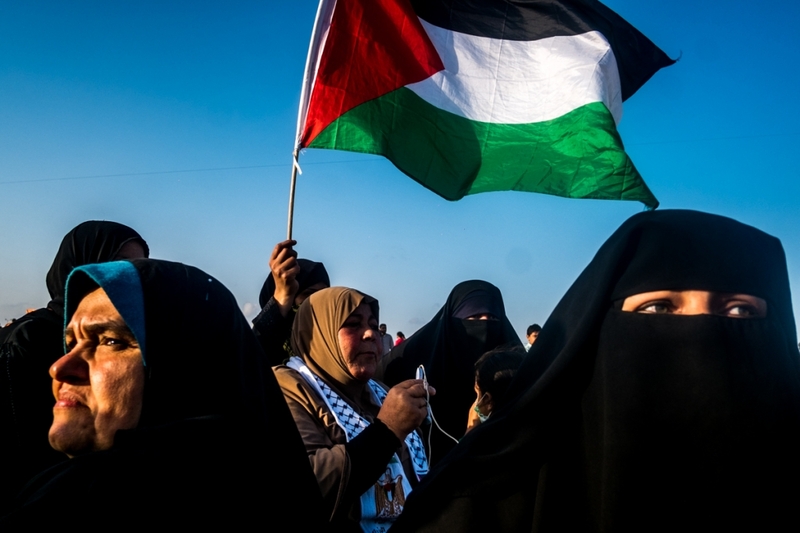 Women pose Palestinian flag in hand. 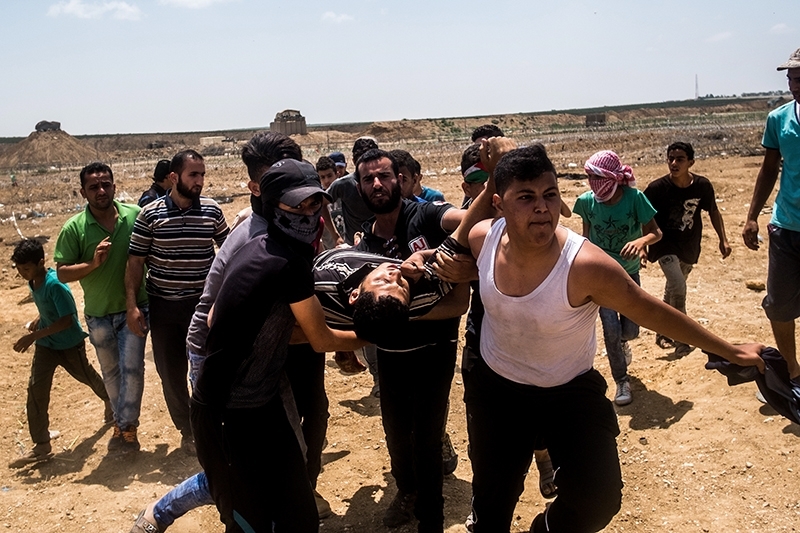 Tensions are high along the Gaza-Israel border following more than a month of weekly mass protests near the fence that has left 50 Palestinian protesters killed and over 1,700 wounded by Israeli army fire. Gaza's Hamas rulers have vowed that the marches will continue until the decade-old Israeli blockade of the territory is lifted. Protests are expected on May 14 and 15 also, the day Palestinians mark the Yawm an-Nakba or "Day of Catastrophe", to commemorate the anniversary of their mass uprooting during the 1948 war over Israel's creation. May,11th 2018. Malaka. Gaza. Palestine. 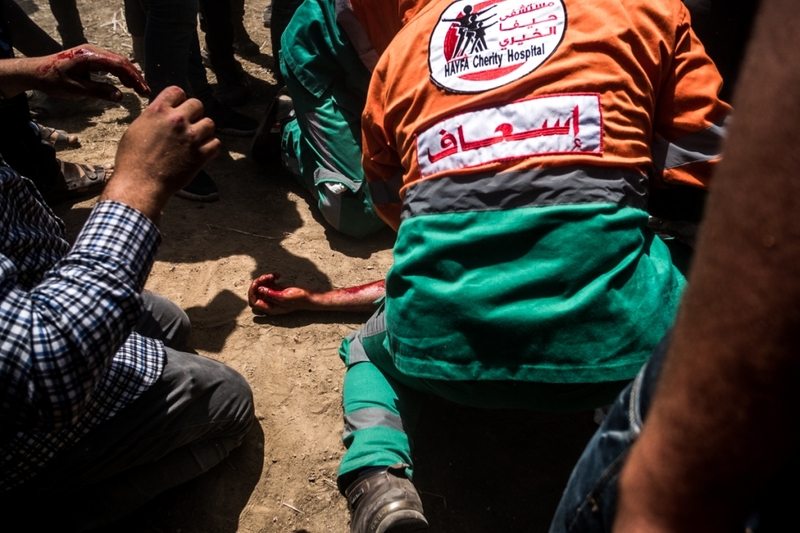 A wounded Palestinian demonstrator is dispatched to a hospital after getting injured as a result of an intervention by Israeli security forces during a protest, organized to mark 70th anniversary of Nakba, also known as Day of the Catastrophe in 1948, and against United States' plans to relocate the U.S. Embassy from Tel Aviv to Jerusalem. May 14, 2018. Gaza city. Palestine. Dead body of Palestinian is seen at a hospital's morgue after Israel's intervention during a protest, organized to mark 70th anniversary of Nakba, also known as Day of the Catastrophe in 1948, and against United States' plans to relocate the U.S. Embassy from Tel Aviv to Jerusalem, at Gaza-Israel border near Jabalia Refugee Camp on May 14, 2018. May 14, 2018. Malaka. Gaza. Palestine. Un manifestant palestinien blesse est envoye a l'hopital après avoir ete blesse a la suite d'une intervention des forces de securite israeliennes lors d'une manifestation organisee a l'occasion du 70eme anniversaire de la Nakba, également connue sous le nom de Day of the Catastrophe déplacer l'ambassade americaine de Tel Aviv a Jerusalem. 14 mai 2018. Malaka. Bande de Gaza. Palestine. A wounded Palestinian woman demonstrator is dispatched to a hospital after getting injured as a result of an intervention by Israeli security forces during a protest, organized to mark 70th anniversary of Nakba, also known as Day of the Catastrophe in 1948, and against United States' plans to relocate the U.S. Embassy from Tel Aviv to Jerusalem. May 14, 2018. Gaza city. Palestine. 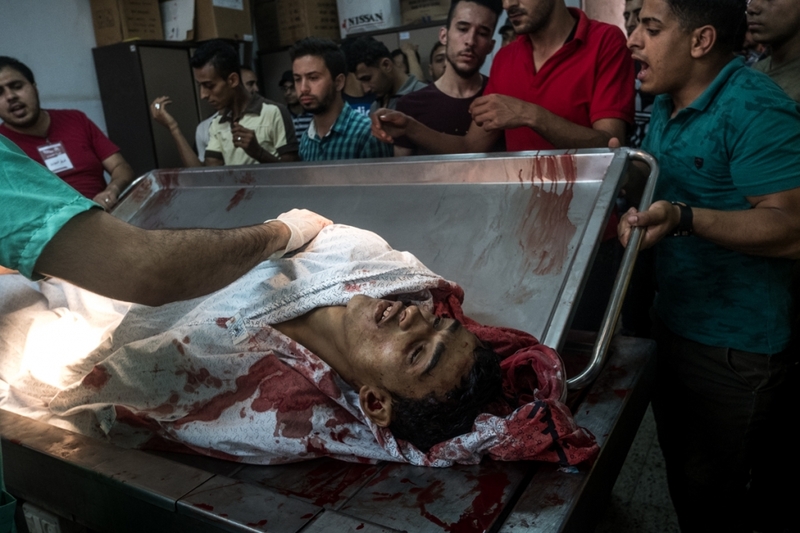 Mohamed Akram Abo Lehya, 26 ans, est hospitalisé à l'hôpital Al-Awda après avoir été blessé lors d'affrontements avec les forces israéliennes près de la frontière entre Gaza et Israël, bande de Gaza, Palestine - le 14/05/2018 Les soldats israéliens ont tué plus de 55 Palestiniens, dont 7 enfants, et en ont blessé plus de 2 000, alors que les manifestations à la frontière entre Gaza et Israël coïncidaient avec l'ouverture controversée de l'ambassade des Etats-Unis à Jérusalem. Ceci marque le jour le plus meurtrier de la violence à Gaza depuis 2014. Les dirigeants du Hamas à Gaza ont juré que les marches continueront jusqu'à ce que le blocus israélien du territoire soit levé depuis une décennie. Depuis le 30 mars jusqu'à maintenant, 104 Palestiniens ont été tués par des tireurs d'élite israéliens lors de la grande marche de retour appelée aussi Nakba. 14 mai 2018. Gaza. Palestine. Des membres de la famille et amies rassembles dans la maison du defun, Jaber Salem Mustafa, un homme de 40 ans. Il est decede d?un tir de sniper dans la poitrine pendant la manifestation du vendredi 12 mai lors d affrontements avec l'armee israelienne. 12 mai 2018. Khan younes. Gaza. Palestine. 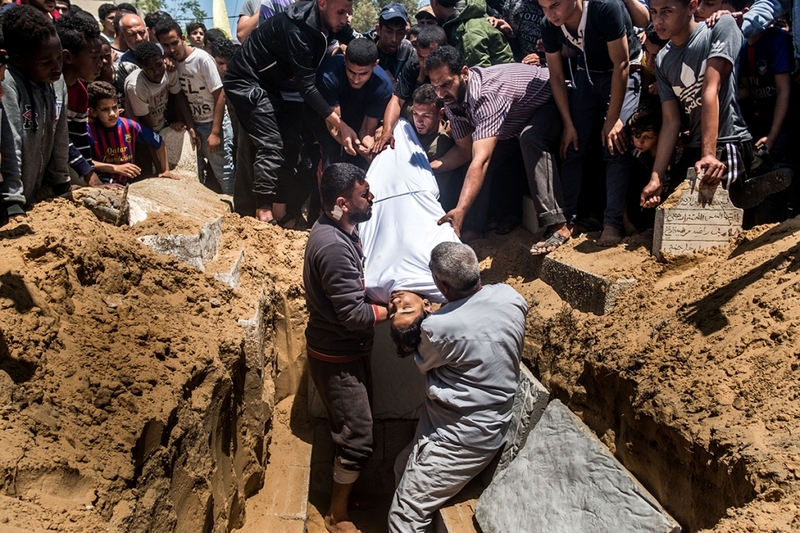 Friends and family mourn over the body of Jamal Affana (15) after he succumbed to a gunshot wound sustained during protests last Friday at the Gaza border fence with Israel on May 13, 2018 in Rafah, Gaza. 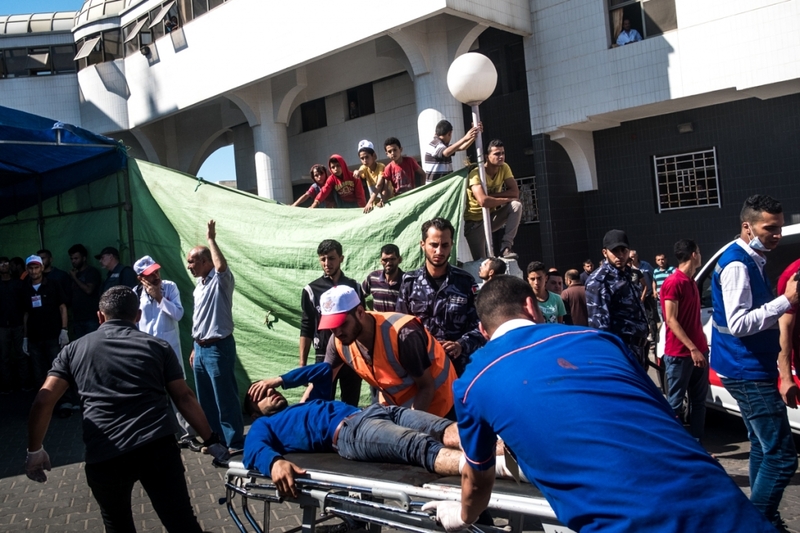 Affana was killed Friday by an Israeli sniper while participating in the demonstrations. 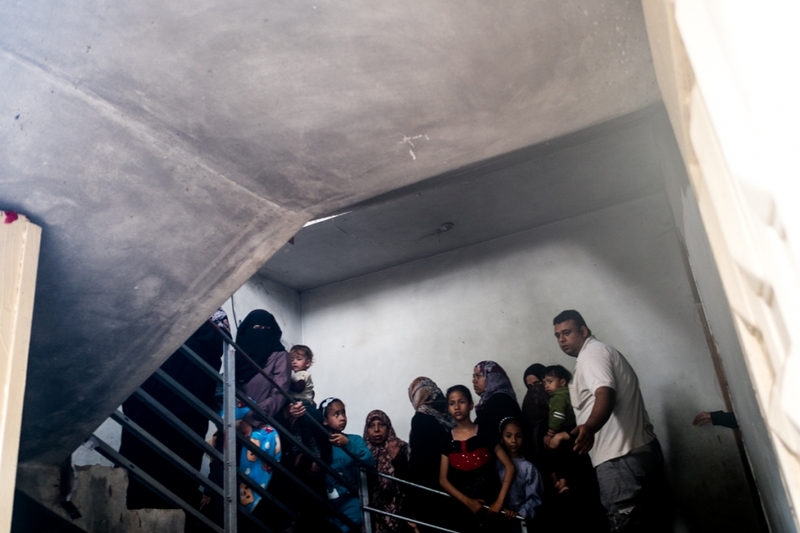 For the 1.9 million Palestinians living inside the Gaza Strip life has become a daily struggle for food, electricity and money after 10 years of an Israeli blockade on the area. 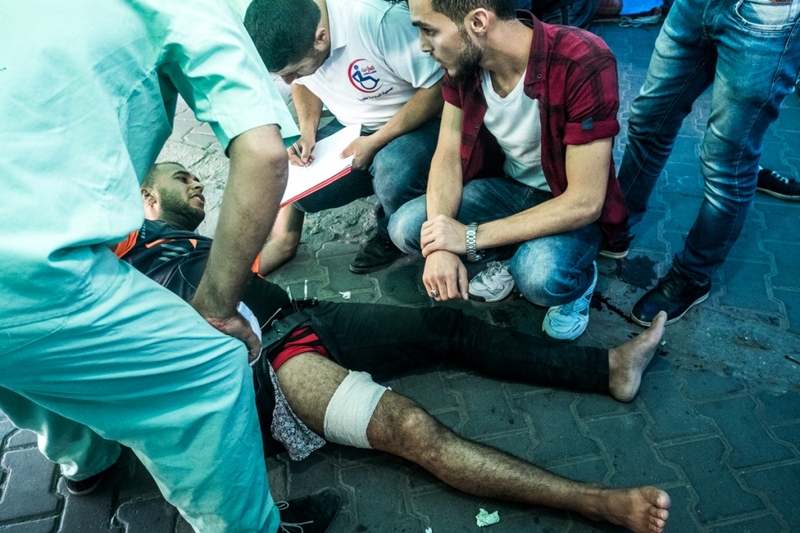 The protests have so far left 40 Palestinian dead and over 1,700 wounded by Israeli army fire. Gaza's Hamas rulers have vowed that the marches will continue until the decade-old Israeli blockade of the territory is lifted. 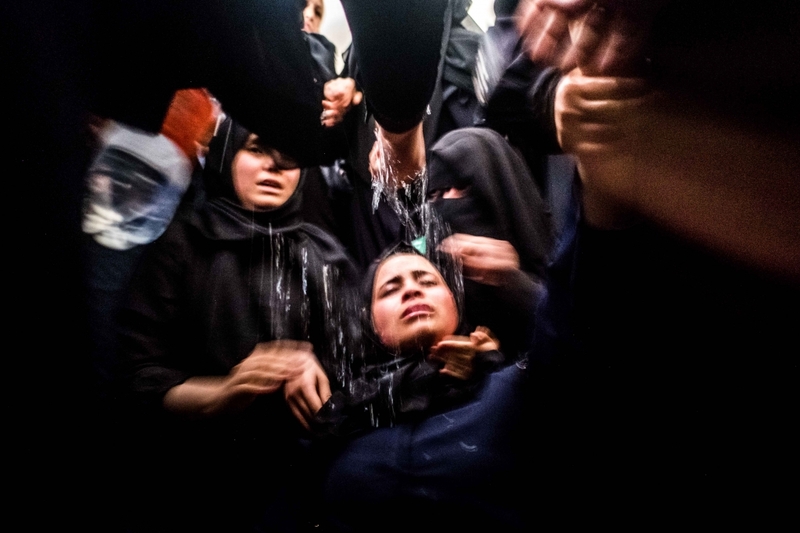 On May 15 the protests will culminate to mark the "nakba" or catastrophe, to commemorate the anniversary of their mass uprooting during the 1948 war over Israel's creation. May, 13th 2018. Rafah. Gaza Strip. Palestine. Burial of Jaber Salem Mustafa, an 40 old man. 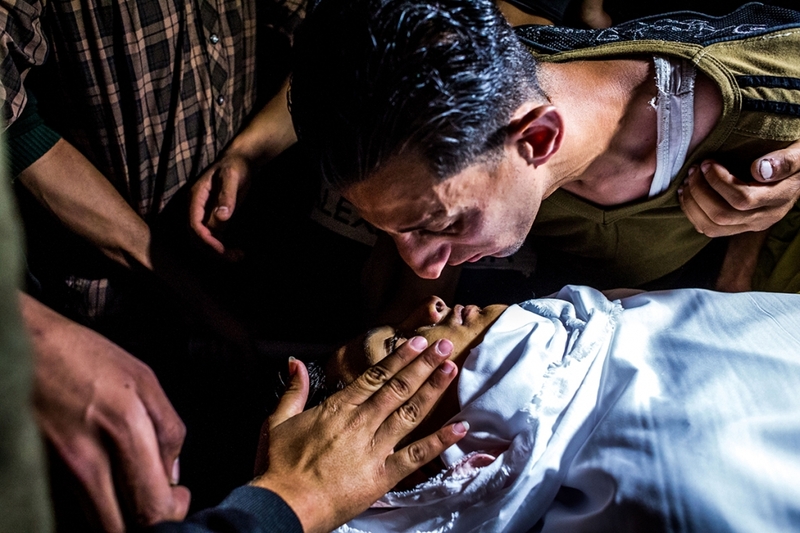 He died during the demonstration of Friday, May 12 during clashes with the Israeli army. he was shooted in the chest. 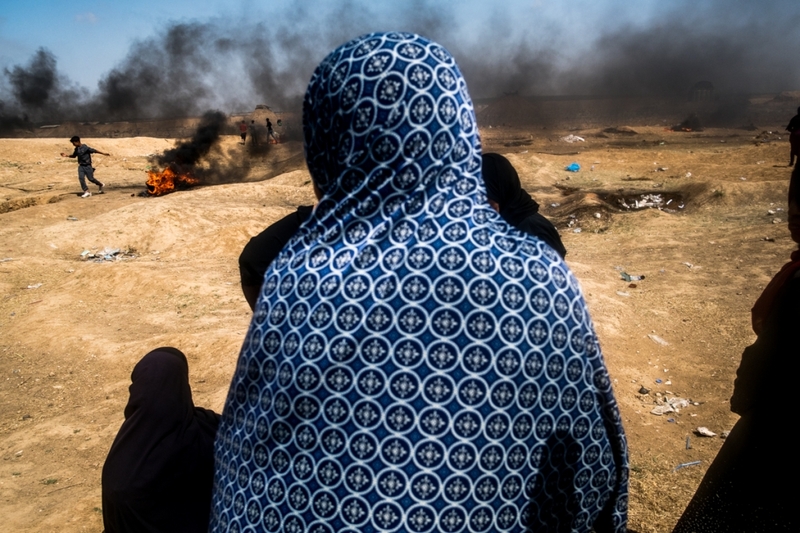 Tensions are high along the Gaza-Israel border following more than a month of weekly mass protests near the fence that has left 50 Palestinian protesters killed and over 1,700 wounded by Israeli army fire. Gaza's Hamas rulers have vowed that the marches will continue until the decade-old Israeli blockade of the territory is lifted. 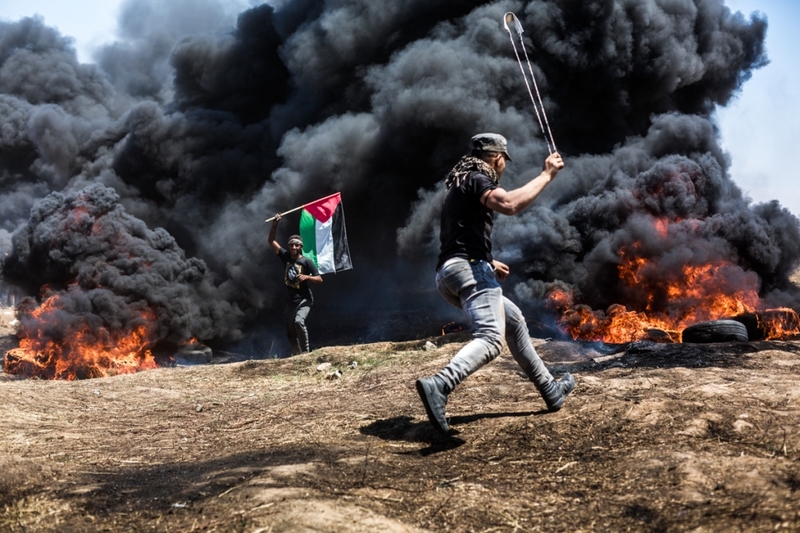 Protests are expected on May 14 and 15 also, the day Palestinians mark the Yawm an-Nakba or "Day of Catastrophe", to commemorate the anniversary of their mass uprooting during the 1948 war over Israel's creation. May,12th 2018. Khan younes. Gaza. Palestine. 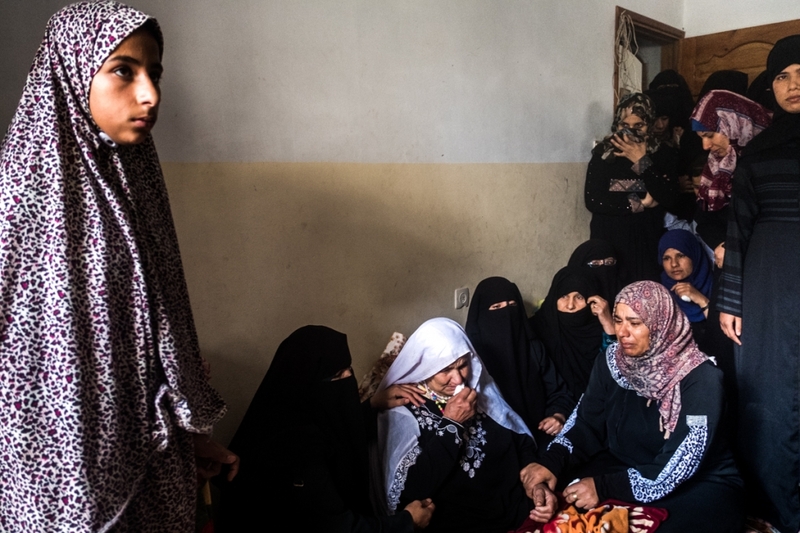 Women help Amr Abu-Foul's wife who has just lost consciousness near the body of her husband whom she sees for the last time. Amr Abu-Foul, a member of Hamas's military wing (Al-quasam), died this morning from a chest injury after a sniper fire during clashes yesterday on the Gaza-Israel border in Malaka. May 15, 2018. Gaza Strip. Palestine.